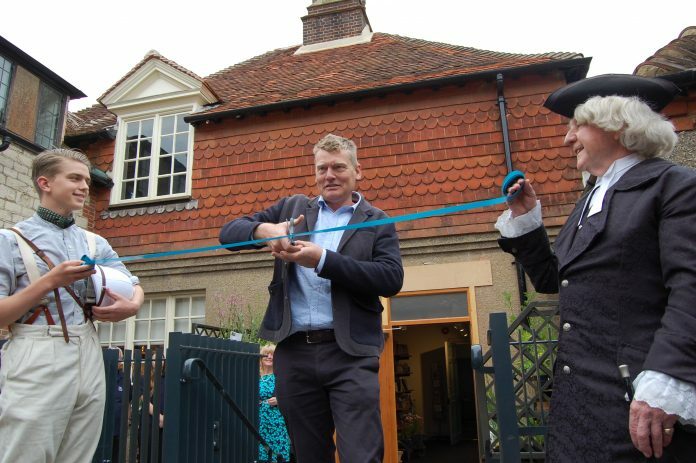 TV presenter Tom Heap opening the Gilbert White and The Oates Collections. A £2.8 million redevelopment scheme at Gilbert White and The Oates Collections, the former home of pioneering naturalist Gilbert White – projected managed by Nottingham’s Focus Consultants – has now been completed. The renovation of the museum and estate in Selborne includes restoration of the stable yard and brew house, providing a new entrance, a shop and a café for visitors, as well as the conversion of the upstairs into an apartment. In addition, the creation of a new library, and temporary exhibition space, will help the museum to display more artefacts – including one of the few surviving original copies of Aurora Australis, the first book to be written, printed and bound in Antarctica, and which was edited by explorer Sir Ernest Shackleton. The temporary exhibition space will provide the correct conditions to house artefacts ‘on loan’ from other museums such as the Natural History Museum. Partner at Nottingham-based Focus, Steven Fletcher, said: “The team at Focus Consultants was delighted to be a part of this scheme at Gilbert White’s House, using our expertise to help shape a new chapter in the life of the home and gardens, and providing additional space to showcase exciting exhibits. Museum Co-director Judith Bowles said: “We are thrilled with our new spaces and the flexibility they bring to the museum. The restoration of Gilbert’s stables, coachhouse and stable yard has not only preserved the old buildings but enhances the new entrance allowing us to welcome and better explain why we have three explorers of the natural world under one roof.